Turning to the electronic side of design for a moment, I stumbled upon Pixel Pixel Pixel yesterday. It's a site full of free downloads for web designers mainly, but there are goodies there that everyone can enjoy. 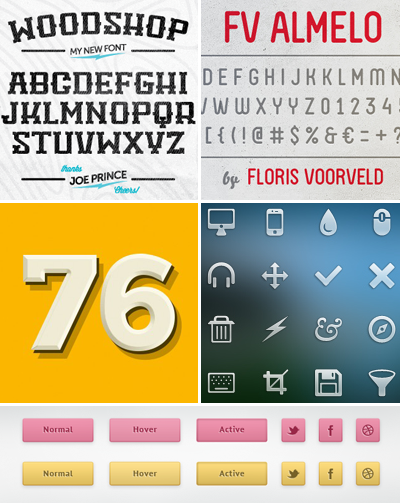 Free fonts, anyone? Check out the full archive of seamless patterns, textures, vector shapes, buttons, icons, and more at pixelpixelpixel.com. A huge thank you to the designers who have generously shared their work! That's a great site! Just added it to my reader. Thanks! Hey, this looks great! Thanks for sharing. As a web designer and overall geek I'm always on a search for good resources. Thanks Jessica. The site looks very interesting! I'm excited to use these goodies myself! Hey Thanks for all this. I can't wait to use these fonts on my new site.